Ahead of next weekend’s LOUD WOMEN Fest in London we talk to Cassie Fox, founder of the events collective behind the day, about ten must-see acts on the line up. Last October Cassie Fox, of The Wimmins’ Institute and Thee Faction, looked at the London gig listings and was struck by something; how male-dominated they were. Yet, there was a growing women-led movement in music with a resurgence of women-led bands. Since then Cassie has run 17 gigs, showcasing 42 bands, pulling in packed audiences and raising thousands for women’s charities. But why this recent resurgence in women-led music? The current social climate Ngaire Ruth, Melody Maker journalist for 15 years and occasional Louder Than War contributor, said: “New women-led bands are being set up in reaction to the austerity cuts, which disproportionally effect women. It’s nothing new, either the issues – which is why we need to be loud – or a politically motivated scene, led by women, but it’s definitely a fresh approach. Here she picks ten of the acts you should check out now from the line up. Tickets for the event are available here. Described by MOJO as “Aretha fronting Royal Blood”, this London-based band uniquely blend afropunk, psych and soul. Their live performances include body paint and fire – actual fire. Hotly-tipped indie post-punkers, led by the immaculate Jo Bevan (of Joanne Joanne fame). The band have just finished touring with Chameleons Vox and have a superb new album coming out. Manchester-based folk-punk singer songwriter Louise has gained a massive following all over the UK, and also darling of West coast USA. She self-released her debut album, Dreams from the Factory Floor, with a second album in discussion currently with a major label. Watch this space. “Feminist punk witches from hell” – this foursome played their first ever gig at the first ever LOUD WOMEN night in October 2015, and since then they’ve regularly sold out venues, released an EP, and this summer headlined Glastonbury’s Sisterhood stage. Loud Women’s founder, Cassie Fox’s own band – a pop-punk supergroup of sorts made up of two former Linus members, and two current Thee Faction members. The band’s debut album ‘Badass Lady Power Picnic’ has been widely cheered in the music press, and regularly played on BBC 6. For fans of The Raincoats and Throwing Muses. A late addition to the line-up –in the spirit of Loud Women helping to promote brand new bands who are building their followers. But a rightly-deserved place at the Fest – this angry but melodic foursome have just self-released a top class EP, and their last appearance at a LOUD WOMEN show earned them a photo on the front cover of The Morning Star. The band with the best name on the line-up, and arguably the loudest frontwoman too – the awesome Tegan Christmas is a force to be reckoned with. The Franklys are a four-piece Swedish/US/UK blaze of hair and blurred lipstick mixing raw garage rock with hints of ’60’s psych and ’70’s rock. If you can keep in focus as they play loud, in your face big riffs, then frankly, you’ve got The Franklys. These girls are a righteous mix of old and new, creating timeless music. Stalwarts of the UK intersectional feminist DIY punk scene, Cheltenham’s Fight Rosa Fight! have produced their own albums, a vast array of homemade merch, and zines. Textbook LOUD WOMEN. 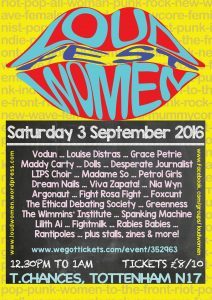 LOUD WOMEN Fest takes place on 3 September at T.Chances, Tottenham, London. It features 25 women-led acts across two stages and tickets are available here. You can also find the event details on Facebook. You can find the LOUD WOMEN community on Facebook for details of other events and to sign up to their regular eZine.